Lenny: You gotta meet Aunt Mema. I'll get her to do her famous "feh" for you. Lenny: Her impression of a Jewish seagull. Controversial comic Lenny Bruce, who flirted with fame in the early 1960s, drawing a cult following as much for his words as for the reactions they caused, died long before his time. His standup routines, which meshed crude language, razor sharp satire, and frank social commentary, seem relatively tame today. But 40 years ago, he was all but crucified for his teachings, arrested time and again for public indecency, driven to drugs and drink and bankruptcy. Lenny reveled in pointing out hypocrisy, challenging long-held social norms and beliefs, and refused to stop, despite the personal cost, until his myth-making death of a drug overdose in 1966. Lenny, from acclaimed director Bob Fosse (Cabaret, All That Jazz), follows the rise and fall of Bruce's (Dustin Hoffman) career, from his first awkward gigs in trashy bars to his headlining shows at $1000 a week. The story is told in flashback structure, with characters from Lenny's life, from his wife Honey (Valerie Perrine), to his saint of a mother, Sally (Jan Miner), to his manager Artie Silver (Stanley Beck), offering their memories to an unseen interviewer. Throughout, Lenny is shown onstage, performing his comedy routines, offering commentary on the major events of his life�his work, like all great comedy, was born of pain, loss, and personal hardship. Dustin Hoffman inhabits his role like few other actors could, like he rarely would inhabit a role again. When he's on stage, his Lenny comes alive, a charismatic, enraged, fast-ranting fireball, and it's impossible not to cling to every word he says, to realize the truth, the pointed messages, in his "obscene" comic barbs. Nearly matching him, Valerie Perrine is totally authentic as Honey Bruce, his "shiksa goddess." Her love for Lenny, and all the joy and pain it brought her, is clear in every moment she is onscreen. 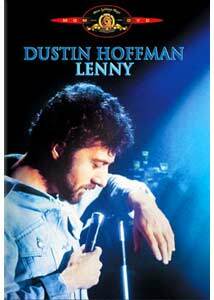 Fosse's cold, documentary-like direction does little to sentimentalize Lenny's life, nor should it. Fosse isn't interested in canonizing a saint; he's simply shedding light on the life of a controversial man. And if it seems that that light reveals no details, no answers, perhaps it is because there are none, because Lenny was nothing more and nothing less than a man driven by art�it was his reason to exist, his gift to the world, and that's all Fosse needs us to see. Lenny Bruce and Bob Fosse were great friends in life; kindred spirits who had difficulty relating to the world outside of their troubled, genius minds. Lenny is Fosse's tribute to his friend, but it's also an homage to himself, a reflection of the pressures and demons that plague every true visionary, people so talented, the frail human soul cannot bear the weight. Image Transfer Review: This transfer is a very nice representation of Bruce Surtees' stark black & white photography. Source material is fairly clean, with just a few marks popping up here and there and a bit of film grain. Detail is pretty good for the most part, though some of the nightclub scenes seem a bit soft and hazy. I noticed no artifacting, though a few patterned shirts show a bit of the shimmer effect. An unmatted 1.33:1 print is offered on the flip side of this DVD-5. Audio Transfer Review: The sound mix offered is the original English mono, and it's suited to the film, though not the cleanest mono track I've heard. Dialogue is always clear, and usually sounds natural, but in some of the more intense scenes, loud shouts tend to sound rather harsh. What little incidental music there is, is presented with a decent amount of fidelity and never overpowers the other elements in the mix. I noticed and audible background hiss in only one scene (set in a diner). Extras Review: Sole extras include the trailer and subtitles in English, French and Spanish. 1974 was quite a year for film. Nominated for a Best Picture Oscar� along with Coppola's The Conversation and The Godfather: Part II, it's no wonder that Lenny failed to walk away with any awards. But Fosse's film is still as striking and funny as it ever was, and as bleak; an uncompromising testament to an artist willing to sacrifice himself to his craft.